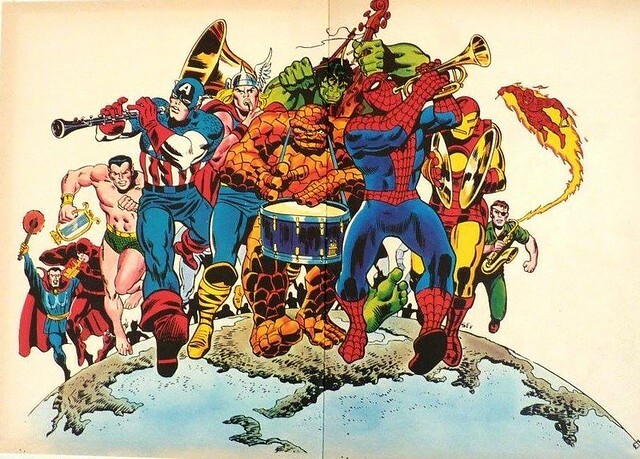 Here's a rarely seen gem that I found on a Facebook page, a Merry Marvel Marching society double page spread by Marie Severin! This was published in a UK comic and the original poster was able to digitally reattach them together. Probably mid to late 1960s when the MMM was still going? The Thing on drums, I like that, and Nick Fury on the saxophone. Not sure about Subby. Nuff Said! Namor is clutching a lyre. Because of course that's what he'd play.